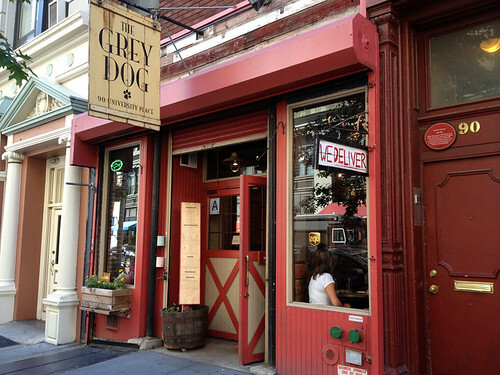 The Grey Dog is my go-to spot near Union Square to meet people for tea, and my sister and I have shared many a cozy drink at its tiny tables (getting a seat can be tricky when it’s crowded though!). But until I met a friend there for dinner last week, I had not tried any of the food. 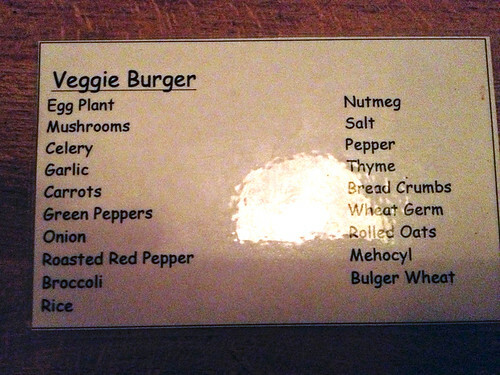 And I hadn’t even realized that they serve a veggie burger! My first thought was that the burger seemed kind of small, but maybe that was just because it was dwarfed by the massive pile of fries next to it? 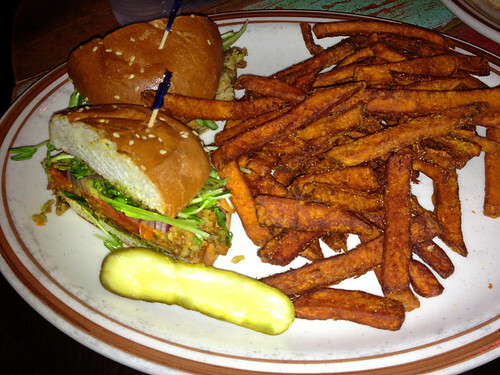 I substituted sweet potato fries in place of the regular fries – and they were delicious. The bun was a little dry, and kind of dense. But the toppings were great – really fresh and crispy pea shoots, tomato, and onion. The pesto was quite tasty, (I am a big fan of pesto!). I only wished there was some other sauce as well to balance out the dryness of the bun. So the patty itself is vegan, they told me – but the bun is not (contains dairy). They did offer to serve it on a bed of lettuce for any vegans who were interested in ordering it though. And kudos to them for being so well-informed about their ingredients and prepared to answer their customer’s questions! More restaurants should learn from that example. 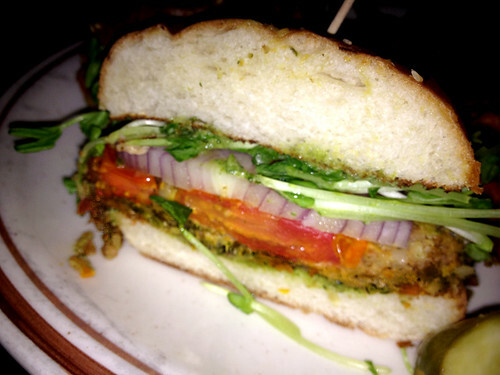 Note: the veggie burger is found under the “Michigan Sandwiches” section of the menu, not the “Burgers” section!